Tomorrow is the first year anniversary of the January 12th earthquake in Haiti. How are you honoring Haiti and her people? Are you supporting any Haitian organizations or relief organizations working in Haiti? Please share what you are doing in the comment section of this blog. Digital Sisterhood Wednesday is also tomorrow. Join us for an all day Twitter party that encourages you to tweet about women and organizations that are working to make the lives of Haitian women better. Follow the party on http://tweetchat.com/digitalsisterhood. Use the hashtag #digitalsisterhood. Start Digital Sisterhood Wednesday with an online yoga and meditation class dedicated to opening your heart to the people of Haiti at 7:00 am ET. Click here to participate. It’s free. You can also watch the video if you miss the live class. My digital advocacy work as a Heart of Haiti Ambassador has opened my heart to Haiti and her people in a major way. After reading journalist Lisa Armstrong‘s article about Haitian women who are mobilizing to fight for protection and justice for their Haitian sisters after the January 2010 earthquake in the January issue of Essence Magazine, I decided to launch a two-year fundraising campaign for Fonkoze, the largest grassroots microfinance institution (MFI) in Haiti that is committed to the economic and social improvement of Haitian people and communities and to the reduction of poverty in the country. Fonkoze was one the organizations mentioned in Armstrong’s Essence article. When Father Joseph Philippe, a Haitian Catholic priest, established Fonkoze in 1994 to support the economic development of all Haitians, he targeted Haitian women. 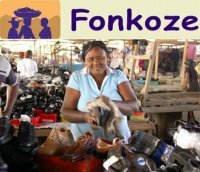 Since then, Fonkoze has served more than 45,000 women borrowers, most of whom live and work in the countryside of Haiti, and more than 200,000 savers. What a powerful legacy! So today I am sharing how I plan to donate $10 per month to Fokaze via its web site (will make my first donation on January 12th) and to raise awareness and funding through my Crowdrise fundraising project from January 12, 2011 to January 2013. I will also use my Digital Sisterhood Network blog, Twitter page, monthly Tweetchats, online and offline events, and radio show programs to raise awareness and seek donations for Fonkoze via Crowdrise. Tomorrow morning I will lead a short online yoga and meditation session at 7:00 am ET that will be dedicated to the people of Haiti and organizations like Fonkoze. Click here to participate in the live show. If you miss it, you can watch the video. At the end of the session, I will invite everyone to join me in supporting Fonkoze by making a donation to their web site and/or my Crowdrise fundraising project this week to honor Haiti and her people on the first anniversary of the January 12th earthquake. You don’t have to wait until tomorrow to make a donation. Feel free to do it now. See the links above. Thank you for your support! PS: Check out the video below featuring one of Fonkoze’s graduates. It is powerful. It will open your heart even more to Haiti and her people!